On the southeastern coast of Losinj Island, little Veli Losinj is only 4km from Mali Losinj, its big sister. Despite its name (veli means big), Veli Losinj is actually much smaller than Mali Losinj and retains the ambience of an authentic fishing village. The town is hilly and pretty with narrow streets, stone houses and lots of greenery. 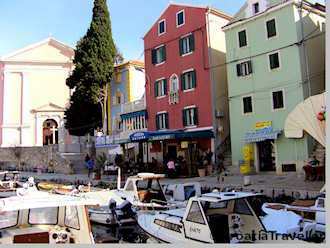 Like Mali Losinj, Veli Losinj was a health centre under the Austro-Hungarian regime and has a long tradition in tourism. In 1866, Archduke Carl Stephen built a castle and imported over 200 rare plant species to plant in the castle garden. The castle now houses a sanatorium but the many rich sea captains who settled in Veli Losinj followed the Archduke's example and created lovely gardens around their houses. Glimpsing these exotic gardens makes a walk through town a delight. There are a few sights in Veli Losinj. Notice the striking Venetian Tower built in the 15th century that now houses a small town museum. The aforementioned rich sea captains also saw to it that St Anthony's Church on the harbour was richly endowed with Italian paintings. There is some private accommodation and one large hotel in Veli Losinj. Find out more about accommodation in Veli Losinj. Veli Losinj is linked by road and bus to Mali Losinj. There are no ferries connecting Veli Losinj with other ports.